We all strive for some gratitude from time to time, so why not express your "Thank you" to someone special in a stylish manner? Thanks to the classic and timeless design, the Kibaga thank you notes are the ideal choice for multiple occasions. 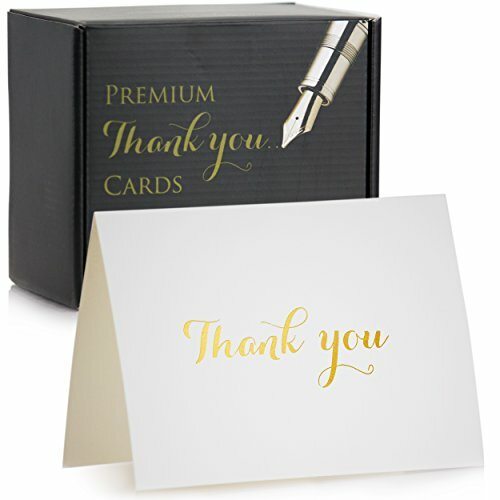 The simple, but noble premium thank you cards come with a sophisticated gold foil embossed lettering on the front. With a folded size of 5.125 x 3.75 in (13x9.53 cm / 13x19.06 cm when open), you'll find ample space to personalize the blank side with a thoughtful message for the recipient and spread some gratefulness! Whether they are sent as Christmas thank you cards, baby or bridal shower thank you cards, wedding thank you cards or for bereavements, the elegant cards can be used both as thank you cards for women and men and are therefore suitable for any purpose. The Kibaga thank you cards are made of high-quality 250gsm art paper (means 'coated one side' to keep the ink on the surface) in combination with a noble gold stamping. On the outside, there is a matte lamination which makes the cards even more sturdy. Another bonus is that it gives them a lovely and elegant touch due to the combination of the matte layer and the gold lettering. These fabulous thank you cards come in a set of 100 notes and 100 envelopes. The white envelopes are made of 100gsm woodfree paper, are self-adhesive and are entirely blank (no printing). With your Kibaga thank you greeting note cards, you'll also receive a robust black box which makes storage not only easy, but also pleasing to the eye. Being told you're appreciated is one of the simplest and most uplifting things one can hear - Add your box of 100 thank you cards to your cart now and show your gratitude!